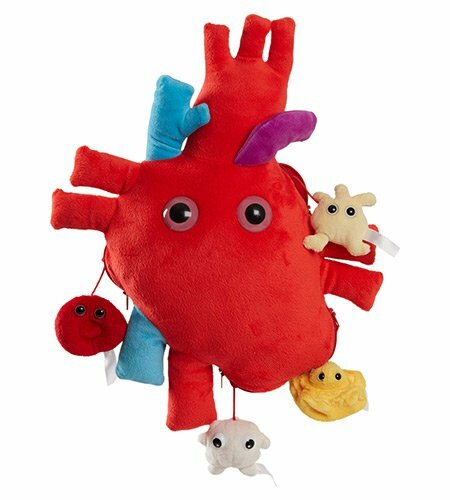 Microbes of the World Blog - Love Your Heart! The perfect gift for Valentine’s Day is heart health. February is a great month to think about the 10-ounce powerhouse that’s long been considered the seat of will and emotion. Throughout history we have recognized the heart’s essential role in sustaining life. The ancient Egyptians believed it was the center of mortality. The ancient Greeks believed it held the soul and the source of body heat. Today we know your heart is truly incredible, beating about 100,000 times per day or 35 million times in a year! Each heart cell is amazing, specially made to pump without rest and with abundant mitochondria and myoglobins to help the cell breathe. Yet heart disease is the leading cause of death in the U.S. for both men and women. By making healthy choices, heart disease can be greatly reduced. Communities, health professionals, and families can work together to create opportunities for people to eat well and keep moving. Other healthy choices include regularly checking blood pressure and sugar levels, avoiding inhaling nasty stuff, and simply doing more of what you love. Talk, laugh, enjoy time with friends and celebrate every positive thing you do! And when your Valentine asks how much you love them, just say “A million blood barrels and 2 billion heartbeats!”.